On 3rd December 2006 the DisAbled Recreation Club of Perth, Australia, in partnership with ACROD WA are having an all day party - Celebration of Ability - and you’re invited. To celebrate the United Nations International day of People with a DisAbility and the launch of the DisAbled Recreation Club, we are having an exhibition promoting participation and what people with disAbilities can do rather than what they can’t do! We have two pavilions at the Perth Convention and Exhibition Centre full of fun filled activities, demonstrations, speakers and exhibitors. Be inspired by the guest speakers including Paralympian Janet Shaw, awed by a demonstration of a hand controlled motorbike and impressed by the skills of the Wildcats who’ll play a game of wheelchair basketball against the Wheelcats and that’s just a few of the events that will be happening throughout the day. Dear Santa: Can I Have Universal Design, Please? Over at Wheelie Catholic somebody is asking the right question. When will Visitability ("Universal Hiousing" in Australia) bring joy to the holiday season? Every holiday, I receive invitations to go to parties at friends and families' homes. The bottom line is that I can't get into these events because no one's home is accessible. It isn't a matter of just getting in the front door, although that can be daunting in itself - I'm getting flashbacks here of using pieces of plywood to roll up eight concrete steps - but once inside, the hallways may not be passable and of course, the bathroom may not be accessible. My friends with disabilities have accessible housing by necessity so I can always be with them, but they live many miles away. It is discouraging as a person who works toward inclusion to discover that the friends I have who are not disabled might as well be living in a castle with a moat with alligators in it! The conference reinforced that what it means to be old is changing. Many people over the age of 70 are staying active, whether it’s someone in Norway (a world leader in universal design along with Japan) extending their career or a grandparent in sub-Saharan Africa taking care of an HIV-positive baby whose parents have died of AIDS. It isn’t just polite to make their world accessible: it’s imperative. Calling climate change the “greatest market failure” ever seen, a report prepared for the U.K. Treasury says the aviation industry is likely to be “among the fastest-growing” contributors to the problem by 2050. It has called for both the aviation and shipping industries to be slapped with a “carbon pricing” structure to curb emissions of greenhouse gasses. Released with much fanfare in the U.K. earlier this week, the conclusions of the so-called Stern Report are sure to put the lifeblood industry of travel & tourism on the defensive to account for the environmental downside of deregulation, liberalisation and unbridled open-sky competition that has seen more people take to the air than ever before in recent years. Continue reading Travel Impact Newswire. Wheelchair Dancer has several posts on her recent travels. "On my last trip to NYC, I had the misfortune to meet the TSA person from hell." Continue reading Travel With Wheelchair Dancer. The Brazilian non profit Caminadores is part of the vibrant national market for inclusive leisure and adventure travel. Activites include trail walks, orienteering, rappelling, as well as infrastructure building and marketibng projects such as tourist maps and accessibility audits of tourism venues. London Underground, in partnership with Direct Enquiries, has commenced assessments of all of their 274 stations, as part of a commitment to improve access for customers. The assessments, conducted by Direct Enquiries (the Nationwide Access Register), are the first step in a campaign to make access details of London Underground more accurate, timely and widely available. This follows on from work to determine where actual improvements to access could and should be made. The assessments will provide London Underground with detailed reports on all public areas of the network, allowing them to understand the access routes and facilities available to people who have specific requirements. This includes disabled people, older and younger people, parents with pushchairs and people with luggage. Once the assessments have been completed, the information will be made available to the public through www.directenquiries.com, the TfL journey planner and paper-based customer information products. When your spouse uses a wheelchair, your travel options aren't so much limited as they are dependent on creativity and flexibility. Long cross-ocean flights, for example, are not out of the question. But a wheelchair user with stiff joints, constant pain and prevalent fatigue due to severe rheumatoid arthritis will cope much better with eight-plus hours of flying if he or she can be accommodated with the roominess of a business-class seat. The same goes for a place to sleep far from home. On a trip to Spain, we found there are barrier-free hotels, hostels, palladores and apartments, but that only about one in 50 is wheel- chair-accessible and about one in 10 of those advertise the fact that they can accommodate a disabled traveler. And some places somehow come to the conclusion that they are wheelchair-accessible even though the only route to the front door is via eight steep, slippery steps. Continue reading Fly With Steve Wright. A travelogue on a trip to Australia and New Zealand. Do You Have More Examples of Accessible Design? Continue reading Singapore: Diffusion of Universal Design. After reading a book called The Wilderness Family by Kobie Kruger I was determined to visit Africa myself. The book is about living in the Kruger National Park as the wife of a game ranger and the trials of bringing up three children with orphaned animals running riot through the house and crossing hippo infested rivers to get to the car every day. I was so inspired by the book and my Dad’s tales of the African bush throughout my childhood that I just had to go and give Dad a chance to see it all again. Continue reading A Story of South African Travel. December 3 is the United Nations International Day of Disabled Persons. Continue reading December 3, 2006: United Nations International Day of Disabled Persons. "If you build for accessibility from the get-go, you won't shut people out from coming back from other states" if they left after Hurricane Katrina, said Martin Gould, director of Research and Technology for the agency. Take out you cameras and contribute to this project to document the many faces of the International Symbol of Access. Continue reading The Disability Access Symbol Exhibition. Candy Harrington is following the Canadian debate on whether or not attendants and companions should have to pay full fare when accompanying a passenger with a disability. See One Person, One Fare? The signs, stripes and wheelchair logos painted on the pavement make it obvious the spots are earmarked for disabled drivers. But motorists eager to park close to a store or restaurant frequently ignore those warnings. "It's a total disregard for anything,'' said Bill Bogdan, the disability liaison for Illinois Secretary of State Jesse White who uses a wheelchair himself. Continue reading Disabled Parking Violators: A Thanksgiving Sting in Chicago. Monday November 27 starts the four day software giveaway here at Rolling Rains. 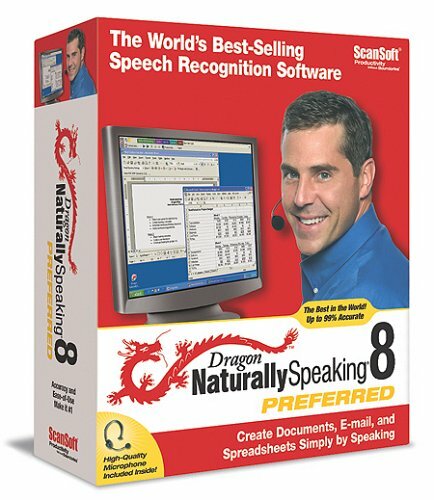 Pick up a copy of Dragon Naturally Speaking voice recognition software. Continue reading Destinations 2006: Tourism, Peace, & Sustainable Development. One of the things that I give thanks for today is a vibrant, international Disabled Community and the wonderful celebration of its strenght over at Goldfish's hosting of the Disability Blog Carnival. Welcome to all who have stumbled upon the Rolling Rains Report through the Carnival - and a reminder to all that there will be a contest here for free copies of Dragon Naturally Speaking voice recognition software starting Monday November 27. The contest only runs for four days. Check back and snag free software! Continue reading Happy (US) Thanksgiving!. Build for All is an EU project of capacity building for inclusion. November 15 was the launch of the Build for All project manual. Continue reading Forum Européen des Personnes Handicapées. Have you seen the photos at Rolling Rains - Travel With a Disability? There are over 200 and they come from all over the world. José Isola of Peru is co-author of the first history of accessible tourism. He has been a longtime advocate for Universal Design and all the areas advocated here at the Rolling Rains Report: Visitability, Inclusive Destination Development, and Inclusive Travel. It's an honor to announce to you all that by democratic and popular elections, held yesterday in Peru, I have been elected a Town Councilman for the District of San Isidro, where I have lived almost all my life. The team led by Mr. Antonio Meier was elected by more than 45% of the votes and we will take office on January 1 st 2007. In times like these the only thing I can think of is to deeply thank all those friends that in one way or another have supported my activities in favor of people with disabilities over all these years. Continue reading Disability Rights Advocate José Antonio Isola de Lavalle. Sanbria Lake in the Parque Natural del Lago de Sanabria y alrededores is about to become more visitable through the application of the principles of Universal Design. Continue reading Castilla y León Implements Universal Design in the Parque Natural del Lago. Universal Design has an opportunity to contribute to post-Katrina recontruction through the event “A Cultural Charrette: Conversations about Coast Community Life"
Four Mississippi cultural agencies will host a cultural charrette in Gulfport on December 1 and 2. The Mississippi Arts Commission, the Mississippi Humanities Council, the Mississippi Library Commission and Mississippi Department of Archives and History are holding the event at the Jefferson Davis Campus of Mississippi Gulf Coast Community College. This innovative gathering will bring together organizations and individuals to discuss the unique culture of the Mississippi Gulf Coast—its rich history, architecture, cuisine, way of life and ethnic diversity. Residents will have an opportunity to be part of reweaving the fabric that constitutes the heart and soul of the coastal area. This town hall meeting will encourage collaborations among cultural entities and interested residents as recovery continues. For more information call 1-800-647-7542. Pollo Patagonico is a prolific visual artist with a disability. He contributes his work at http://www.flickr.com/groups/rollingrains/. His latest post, Sin Ideas | Without Ideas turns his sense of boredom into a clever demonstration of his photo animation skill. Continue reading A Break in the Travel Schedule. "Valerie Cooper thought the special features in her new Venice home would come in handy some day. She had no idea that day would come so soon" writes Victor Hull in the Herald Trubune. 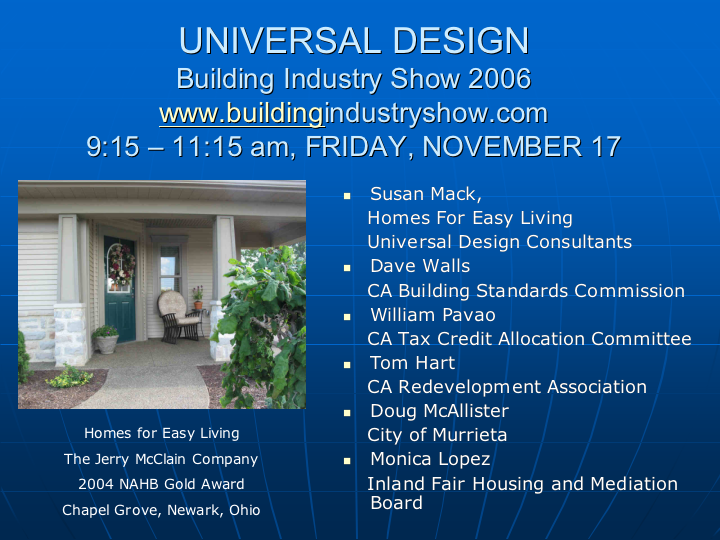 Continue reading Universal Design Comes in Handy for Homeowners. Inclusive Destination Development is being fostered by Spain's premio Reina Sofía de Accesibilidad (Queen Sofia Accessibility Award.) The latest recipient is the town of Lugo. Continue reading Lugo in Galicia Receives Universal Design Award. Text-to-speech is usually the less emphasized function of speech recognition software like the Dragon Naturally Speaking that we be giving away during the week of November 27. Text-to-speech is an important feature for many people with disabilities. I had the opportunity to listen to Stephanie Dailey explain her award-winning web site, , at Georgetown University. As she demonstrated the site's built-in audio output features the linguistics major in me could not help note the quality. There must be a very good algorthm for supra-sentential structure like emphasis and inflection because the robo-voice sounded very real. Keep watching for details but here's the first hint. Once it starts, the contest will only run for fours days once it opens. The Delhi Transport Corporation (DTC) has decided to introduce buses convenient for the elderly and handicapped as well as revamp bus shelters to make the capital's public transport system more commuter-friendly. Continue reading Dehli: Accessible Public Transit. I still recall the sense of surprise and delight at the first time I could feel "chi" as a volume between my hans in a Tai Chi session. Stepping onto a university campus is sometimes similar. Visiting Georegtown last night was one of those times. The regulation is in the 2nd reading at the European Parliament now (Rapporteur Dirk Sterckx, BE, ALDE). The report will be voted in TRAN Committee in December, and in plenary - in January 2007. 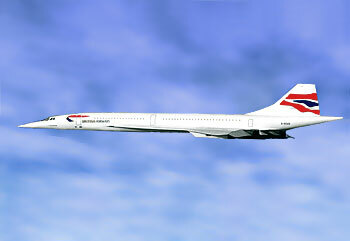 -	the assistance can only be provided at manned stations. On the flight to Washington, DC yesterday there were swashbuckling pirates galore in the in-flight movie "Pirates of the Carribean III". The movie reminded me that even pirates -- Dive Pirates to be precise -- are adopting Universal Design and expanding the number of vacation destinations and leisure activites that are accessible to a broad range of people. As the only resort to dive two of the three Cayman Islands, Brac Reef Beach Resort has added adaptive diver training to its repertoire. Brac Reef Beach Resort has teamed up with Dive Pirates Foundation-an adaptive dive club and charity for divers with disabilities - to offer the underwater world of the renowned Cayman Islands. Continue reading Ahoy! - Disabled Divers Welcome. If you were having someone plan your vacation wouldn't you choose someone knowledgable and experienced? Here's your chance. Cruise the Caribbean this Fall with the person I turn to when I have a tough question about accessible travel -- Candy Harrington. 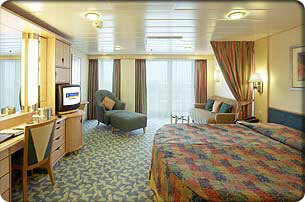 Continue reading A Custom Carribean Cruise. Good start: The Canadian Transportation Agency is holding public hearings on additional air travel costs paid by persons with disabilities. Continue reading Canada Examines Airline Discrimination. The Global Travel & Tourism Summit will be held in Lisbon, Portugal from May 10 to 12, 2007. Continue reading Lison: Global Travel & Tourism Summit. I am a big fan of lifelong learning - new challenges and intellectual exercise through the lifespan. I also enjoy goofing around - playing. So when Chris Coleman of AblePlay asked me to review their program I dropped the work I was doing to go play! 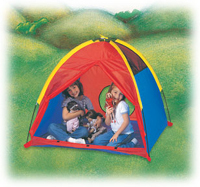 Continue reading Learn Universal Design by Playing with Toys at AblePlay.com. The Rio Declaration on Universal Design as Sustainable Development endorses the alignment of Universal Design and energy efficiency that is exemplified by Tucson's Amory Park del Sol. Read about their approach to to access & visitability. Projects such as this can significantly contribute to the next step -- Inclusive Destination Development. Continue reading Amory Park del Sol: Tucson. Save the date for the TRANSED 2007 conference June 18-19, 2007 in the Palais des congrès de Montréal. See the conference program here. Eatability Sydney, Australia has a special promotion going on. 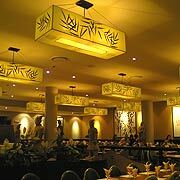 Restaurants listed at Eatability are accessible. A site with such high production values at Eatability can only be a positive impetus to consciousness of inclusion in the local dining market. Win a Night Out at Genghis Khan Mongolian BBQ Restaurant! How would you like to win one of 20 dinners for two at Genghis Khan Mongolian BBQ Restaurant - King Street Wharf or Chatswood - valued at $75 each? Royal LePage Real Estate Services announced the launch of the Royal LePage Seniors Real Estate Specialist (SRES) Designation Program. The SRES designation is a North American real estate recognized designation, and Royal LePage will be the first organization in Canada to become a certified supplier, making it available to its Realtors in response to the changing housing needs, desires and options available to the 50-plus market. Continue reading The Realtor Profession Responds to the Generation Calling for Universal Design. Will Bill Gates Bring Universal Design to Luxury Lodging? Micrsoft's Bill Gates is poised to buy into ownership of the Trang web cá cược trực tuyếnFour Seasons Hotel. Given his philanthropic accomplishments through the Bill & Melinda Gates Foundation one would hope so. However, there are no public indications that he has a leadership vision that includes Visitability. Past performance of his business partner, Saudi Prince Alwaleed bin Talal, who owns Fairmont Hotels & Resorts does not include an emphasis on Inclusion. Apparently the business case for Inclusive Destination Development needs to be made more strongly. Investment tip to Bill: You could own the hotel industry operating system by building out the Universal Design infrastructure of your lodging empire. The bankruptcy of the medical model of disability as a base for social policy is starkly exposed today in the work of Britain's Royal College of Obstetricians and Gynaecology. Promoting discussion of the death of children with disabilities as medicine the College's report includes the statement, "A very disabled child can mean a disabled family" - a false sentence in that the definition of disability is a lack of function. Handicap is the condition experienced by the family and the child with the disability. A disability - a medical condition - may or may not be cureable by medicine. A handicap - a soclal consequence of exclusion due to a medical condition - is a social practice that is "cureable" by non-medical means. One such manifestation of non-lethal approaches to resolving handicaps is the application of Universal Design in various markets such as Visitability in housing and Inclusive Travel and Inclusive Destination Development in transport and leisure. Continue reading Stillborn Arguments for Exclusion. The topic is not Inclusive Travel, Universal Design. 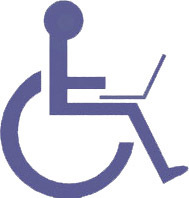 or disability but when have you known me not to include at least part of that triad into an article or presentation? I have the privilige of participating in the Communications in an Unstable World panel discussion series being co-sponsored by Fordham University's McGannon Communications Research Center and Georgetown University's Communication, Culture & Technology program. The topic of the November 14th discussion is Communicating Effectively to an Aging Population. Continue reading Communication in an Unstable World: Fordham University Lectures. Concrete Change is the flagship promoter of the concept "Visitability." Ragged Edge magazine has also developed a valuable online resource at www.visitability.org. So has SUNY-Buffalo's Center for Inclusive Design and the Australian Network for Universal Housing Design. The Center for Universal Design at the University of North Carolina keeps a listing of Visitability-related events here. Symconcept - Handi-skiez à No?l : Vacances de rêve en Haute-Savoie ! SYMCONCEPT (SYMCONCEPT) Résumé : Au coeur de la montagne, dans un village typiquement savoyard, en h?tel ou en appartement , SYMconcept vous garanti un accueil chaleureux et convivial. Continue reading Ski France! (in French). Disabilities Studies contributes to the growth of Inclusive Travel and the 4th Annual Conference of the Canadian Disability Studies Association will be held Saturday, May 26th & Sunday, May 27th at the University of Saskatchewan in Saskatoon, Saskatchewan, Canada. Continue reading Call for papers: Canadian Disability Studies Association. The Call for Submissions has been extended to December 11, 2006 for the Festival of International Conferences on Caregiving, Disability, Aging and Technology (FICCDAT 2007). Continue reading Festival of International Conferences on Caregiving, Disability, Aging and Technology (FICCDAT 2007). Now that's what I'm talking about - some serious attention to the lessons of Katrina! Continue reading New Orleans: National Conference on Disaster Planning - Carless Society. Inclusion of customers with disabilities is in the economic self-interest of the travel & hospitality industry but reliable studies of the market are necessary before most businesses will risk innovation. Scott Gordon's paper researching a neighborhood in Philadelphia from the perspective of wheelchair users reflects the sort of inquiry necessary to educate those who would design destinations and travel products for those with disabilities. Continue reading Research Improves Inclusive Travel. I like klezmer music. Maybe that's why I immediately liked Kevin Kling when I heard him on National Public Radio tonight. No, he is not a musician. He is a storyteller. But his style is, with apologies to the group, is "klezmerim" in the sense of a slightly off tempo building to frantic crescendo that darts sidelong towards its point. Continue reading The How and Why of Life and Death. Polibea Turismo is an important global voice for Inclusive Tourism. Based in Spain their travel and tourism advocacy grew from their established work serving the broader needs of people with disabilities. Here is an announcement of CTCNet's Connections for All training and grant program. It is specifically targeted to Community Technology Centers (CTCs) that hope to better serve people with disabilities but I include it here on the principle that there may be CTCs in the US poised to make a contribution to the travel & leisure information needs of people with disabilities -- maybe something on the order of Polibea's excellent publication. Continue reading Connections 4 All.